WASHINGTON, DC, April 17, 2015 (ENS) – As Earth Day approaches on April 22, the Alliance of Automobile Manufacturers says automakers are on track to “virtually eliminate” smog-forming emissions from passenger vehicles in the next decade – even with more cars on the road and people travelling more miles. Looking ahead, by 2030 passenger cars will contribute just over one percent of ozone emissions from all sources of smog, the Alliance said today in a statement. “Clean cars are here to stay, and as more consumers buy new vehicles with advanced emissions control systems, we will progress even faster,” the group said. On Thursday the Alliance detailed five measures by which it judges clean air progress in automobiles. 1. By 2025, smog-forming emissions of hydrocarbons and nitrogen oxides from passenger vehicles will have dropped 99.8 percent since emissions controls began. The first exhaust emission standards were legislated by the State of California for 1966 model year cars sold in that state, followed by the United States as a whole in model year 1968. The standards were tightened year by year, as mandated by the U.S. Environmental Protection Agency. 2. 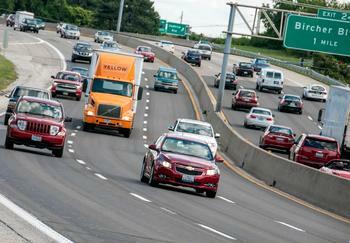 Automakers have reduced ground-level ozone faster than other human sources. By 2030 on-road vehicles are projected to reduce hydrocarbon emissions by about 96 percent compared to reductions of about 63 percent from all human sources, the Alliance said. 3. By 2017 on-road mobile sources will contribute just 6.5 percent of all ozone precursors, down from almost 30 percent in 1970, said the Alliance. Ozone precursors are chemical compounds such as carbon monoxide, methane, volatile organic compounds and nitrogen oxide, which in the presence of sunlight react with other chemical compounds to form ground-level ozone, or smog. 4. By 2030 motor vehicles are expected to contribute only 3.3 percent of all smog-forming emissions entering the Earth’s atmosphere. 5. If only passenger vehicles are considered, excluding medium and heavy trucks, their smog-forming emissions are even smaller, said the Alliance. 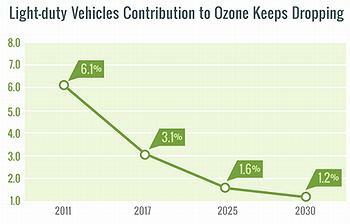 By 2030 cars and light trucks are projected to contribut only 1.2 percent of all smog-forming emissions. Members of the Alliance of Automobile Manufacturers represent 77 percent of all car and light truck sales in the United States. The Alliance includes: the BMW Group, Fiat Chrysler, Ford, General Motors, Jaguar Land Rover, Mazda, Mercedes-Benz USA, Mitsubishi Motors, Porsche, Toyota, Volkswagen Group of America and Volvo Cars North America. Headquartered in Washington, DC, the Alliance also has offices in Sacramento, California and Detroit, Michigan.